4/15/19 – We still need $29,000 to meet our goal of raising $725,000 for network operating expenses. Your donations between now and when we reach our goal, will be matched dollar-for-dollar! 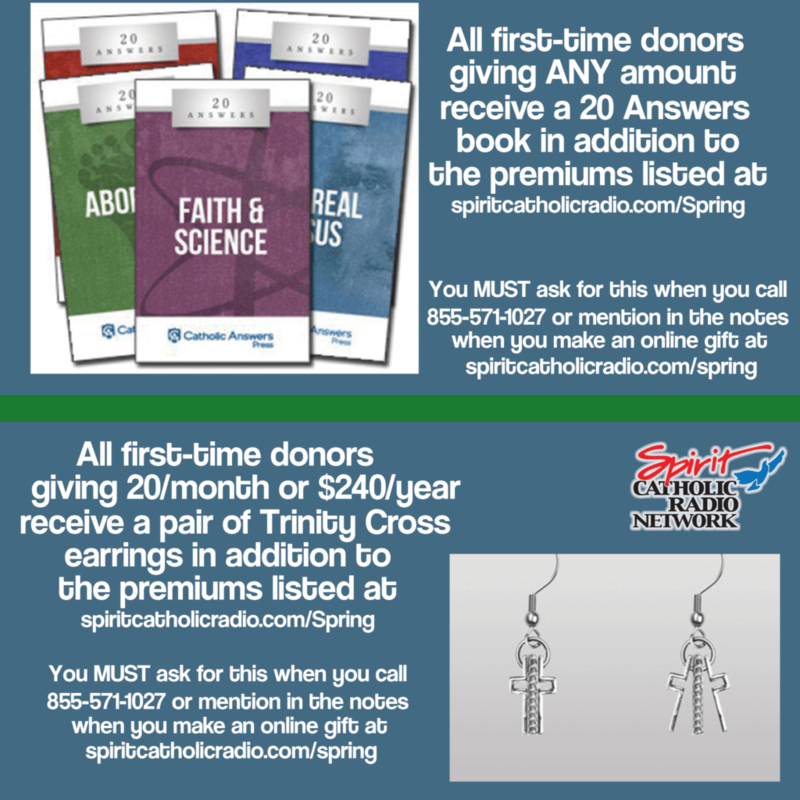 We are asking you to become a family member for the first time or to renew your membership in the Spirit Catholic Radio family by making a gift today. 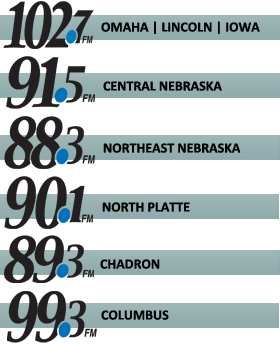 As a non-profit radio apostolate, supported by our listeners, we host two Care-a-thons each year to raise funds to be able to operate the network. With your support and help from the Holy Spirit, we’re able to continue to broadcast the Gospel message over the radio airwaves! Thanks to the generosity of our Challenger Club members (those donating $500 or more in matching funds), we’re currently matching your gifts dollar-for-dollar! So, if you make a gift now, it will automatically be doubled, thanks to our Challenger Club members! Did you know you don’t have to pay your pledge in one lump sum? Pledge payments may be made monthly, quarterly, twice a year or one time. The testimonials and conversions highlighted in the video above are only a few among many. Here at Spirit Catholic Radio, we’re blessed to hear how your support changes and quite literally–saves–lives every day. You, our friends and listeners, are Spirit Catholic Radio. Together with the airwaves and the Holy Spirit, we have–and continue to be–a part of something very special. I invite you to watch a short video at spiritcatholicradio.com/video to see even more. To celebrate our 20th anniversary, we have a number of fun, family-friendly and faith-filled activities and events planned (see right). This is a personal invitation for YOU to join us. As always, we encourage you to bring your friends and family along for the ride. As a listener-funded, non-profit apostolate, we need your support to continue broadcasting for another 20 years. 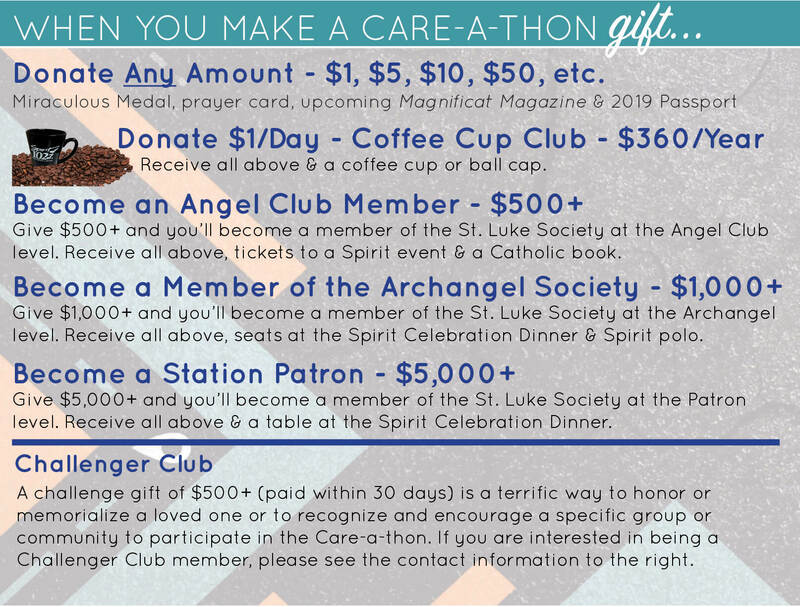 Please prayerfully consider making a gift to the 2019 Spring Care-a-thon. I invite you to tune in and listen during the week of March 25-29. Together, we can bring more people with us on the journey to sainthood. We will not sell, share or trade our donors’ names or personal information with any other entity, nor send mailings to our donors on behalf of other organizations. This policy applies to all information received by Spirit Catholic Radio, both online and offline, on any platform (“platform”, includes the Spirit Catholic Radio website and mobile applications), as well as any electronic, written, or oral communications. To the extent any donations are processed through a third-party service provider, our donors’ information will only be used for purposes necessary to process the donation.